We are one of the few well drilling companies that provides Hydrofracking service in North Jersey, Orange County NY, and Northeast PA. Hydrofracking (also called Hydro-Frac or Hydrofracturing, which is short for Hydraulic Fracturing) is a procedure that experienced well drillers use to increase the flow of water in a low-yielding well. It forces highly pressurized water down a well to widen and extend fractures in bedrock, which increases their supply of water. 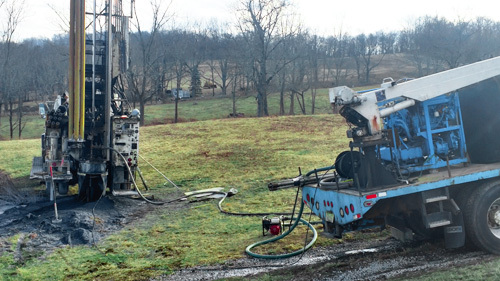 We utilize two types of hydrofracking methods: Standard Hydro-Fracturing and Zone Hydro-Fracturing. Standard Hydro-Fracturing involves the removal of all materials in the well, including the pump and pipes. After these materials are removed, a single packer is lowered down and water is poured through the packer, pressurizing the well. Fractures widen and spread during this process, yielding more water. Zone Hydro-Fracturing uses two packers instead of one. The packers are placed around 70 feet apart and the water forced between them creates high pressure. This method of hydrofracking is used when standard fracturing is not successful. We perform tests before and after a hydrofracking procedure to ensure an increase in water yield. We also sanitize and disinfect the well afterwards to ensure clean drinking water.